Japanese Episode 008: "The Path to the Pokemon League"
American Episode 108: "The Path to the Pokémon League"
Satoshi has become pretty confident in his travels, boasting that he already has two gym leader badges. 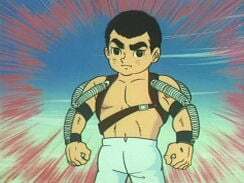 However, his cockiness is soon undermined when he comes across an unofficial Pokemon Gym led by a boy named Akira. The young "Gym Leader" has won ninety-eight consecutive battles, and when he wins his hundreth match, he'll begin competing for Gym Badges in official Pokemon Gyms. Satoshi decides to challenge the trainer, but Akira shrugs him off, confident that Satoshi will give him his ninety-ninth victory. 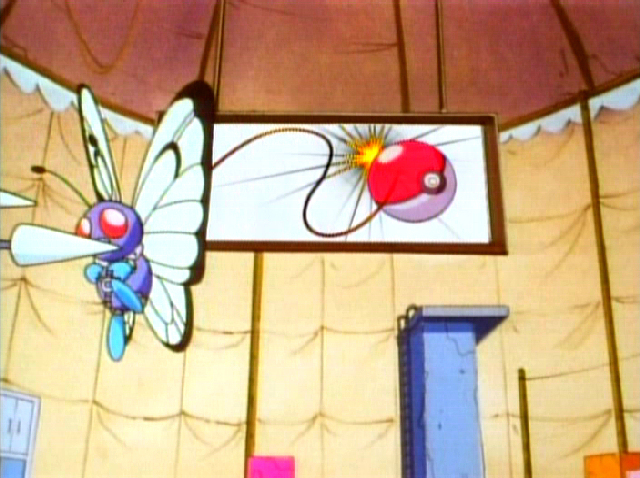 Sure enough, Akira's Sand makes quick work of Satoshi's pokemon, shattering the young trainer's confidence. When the match is over, Akira goes back into his gym and scolds his pokemon for having such a lousy match. Satoshi hears the commotion from outside and goes into the gym to investigate. When he peeks inside, he sees all of Akira's pokemon undergoing extremely harsh training! The young trainer comes to the conclusion that Akira will hurt his pokemon by overworking them so much, so he invites them to leave the gym and join him. The pokemon refuse, and before long Satoshi comes to realize that Akira trains his pokemon so hard because he cares for them so much. Without warning, the Rocket-Dan appear and attempt to kidnap Akira's Sand! After recovering his pokemon, Akira challenges the Rocket trio to a battle. 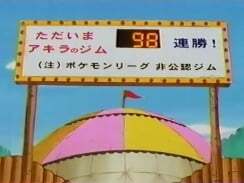 They accept, and before long Akira's Sand is able to defeat the trio and earn victory number one hundred for Akira. 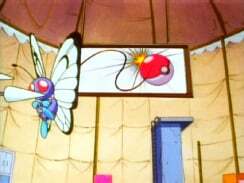 Later, Satoshi and Akira part ways, vowing to meet each other someday in the Pokemon League. ...which is a vow that is, of course, quickly forgotten. This episode presents us with a very skilled trainer and interesting character, Akira. I mean, if you consider the kind of advantage he has starting his pokemon journey with 100 victories under his belt, his gym leader battles should be a breeze. Satoshi and Akira promise to battle each other another day, and just like the Samurai, we'll never see Akira again outside of that one shot in the second opening theme. Sand keeps its Japanese voice. 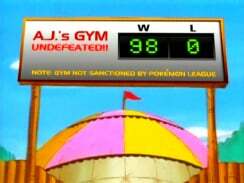 The big paint edit of this episode deals with the scoreboard over Akira's gym. We get some text translation (well, except the A.J. 's GYM UNDEFEATED!! 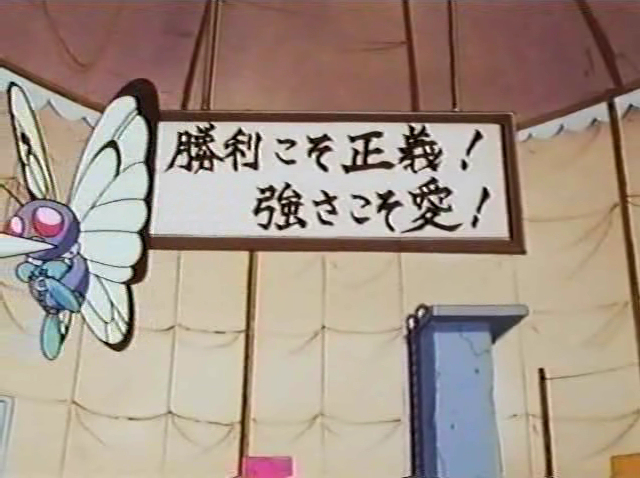 part...the Japanese sign simply says Welcome to Akira's Gym) as well as the addition of a loss counter. 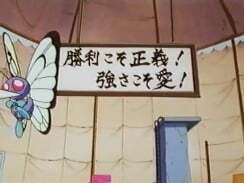 Inside Akira's tent, there's a sign behind the sparring Butterfree and Spear with the words 勝利こそ正義！強さこそ愛！ (Justice in victory! Love in strength!) written out. In the dub, this is replaced with a picture of a whip and a PokéBall. Ash: "Hey wait! I thought you said pacing, not passing!" Ash: "Huh? I said padding...I mean! I said pacing!" Originally, Satoshi tells Akira that Sand's not a sandbag (I'm not to clear on why...). 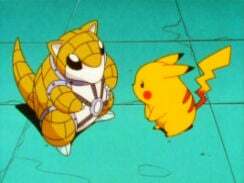 Afterwards, Pikachu holds up a zabuton (because it sounds similar to the word sandbag, I guess) and Satoshi yells at Pikachu for not being serious. Since Sandshrew and pillow don't sound anything alike in English, the scene had to be rewritten. The pacing-passing-padding thing actually works pretty well, so I have to give props to 4Kids for doing a decent job on this. You know at the end of the episode, right before AJ says the rather stilted sounding "When I return I'm gonna be...the number one pokémon master," they do a pan-out of the battlefield and then randomly show a shot of Akira on the cliff with his Sand? Seems kind of sporadic, doesn't it? Well, what 4Kids did was this: The panning out of the battlefield lasts five seconds and then goes straight to Akira saying goodbye to Satoshi. I guess 4Kids thought the pan-out lasted too long or something because they shortened the pan down by three seconds and inserted a three-second shot of Akira and Sand from earlier in the episode. It's such a pointless change that doesn't do anything to the episode, so I wonder why 4Kids even bothered.